Music game sales definitely aren't what they used to be, but exactly how bad are they doing? 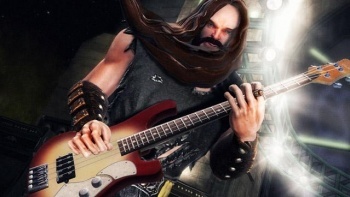 The sales of franchises like Rock Band and Guitar Hero once propped the industry up by over a billion dollars in 2008, but for some reason music games have taken a massive hit in years since. A detailed analysis of music game sales from 2008-2010 shows us that consumers are spending hundreds of millions of dollars less than they once were just two years ago, despite the regular release of products in the genre. Gamasutra analyst Matt Matthews reports that music game sales have dropped by more than a factor of five since 2008. After worldwide sales of music games in 2008 hit $1.6 billion, that number dropped to $870 million in 2009. The holiday shopping season of 2010 will likely have an effect on the current year's sales, but Matthews thinks the genre will need a miracle to go above $400 million. Neither Guitar Hero nor Rock Band have had much success this year, with Guitar Hero's early sales being lower than anticipated and Viacom putting Harmonix up for sale after a similar reception to Rock Band. A possible cause of this huge turn was oversaturation. Since 2008, the market has seen no less than 14 music game releases from the two primary series alone on various platforms from handheld to console. It doesn't help that other studios jumped in with poorly received products of their own, either. Music games have been everywhere, and their peripherals have been filling up people's homes. At the core, I personally don't see a huge difference between Guitar Hero and Guitar Hero: Warriors of Rock, two games released five years apart, so I can understand why consumers aren't out in force to purchase each new version. In the defense of music game creators, it is a bit of a nightmare to figure out how to distribute a new game that requires a set of peripherals that consumers may or may not already have, but if you ask me the music game genre was terribly mismanaged and this is why a large segment of the audience that was once there just doesn't care anymore.